This perhaps the most peculiar of all the mesembs, found only in a small isolated area in the Namib desert; yet it is easy to propagate. Jensenobotrya lossowiana is a shrub with thick woody, prostrate or hanging branches forming large dense mats 400-1000 mm in diameter. It has a fibrous root system and the branches are brittle and covered with dark brown to blackish, flaking, longitudinally fissured bark. Old branches are bare for up to two-thirds of their length and may be up to 70 mm in diameter. The younger branches have spongy internodes 5-10 mm long and up to 5 mm in diameter which are brownish at first and bear the remnants of old persistent leaves. The leaves are club-shaped or spherical, 20-30 mm long and 15-18 mm in diameter, very fleshy and opposite with the leaves of a pair fused at their base. They are smooth and vary from grey-green to pinkish or purplish green and their ends are blunt and faintly keeled. The breathing pores (stomata) are not sunken as in many desert plants. Two or three functional leaf pairs are borne at each branch end with the second and/or third pair gradually withering as moisture is recycled to the pair above. The upper half of older leaves is often covered with a black fungal growth. The flower stalks (pedicels) are about 10 mm long and the reddish buds open during the day. There are 5 sepals 4-5 mm long, reddish purple, with blunt ends and the inner margins are thin and translucent. The petals grow in two series, are 10-12 x 2 mm; modified stamens (filamentous staminodes) are absent. The stamens are numerous, 3-4 mm long, white and grow diffusely. The ovary is flat or concave on top; the dark green nectary glands grow in a ring on the margin. Five awl-shaped (subulate) ascending stigmas arise in the centre of the top of the ovary. The fruiting capsule is 10-12 mm in diameter, funnel-shaped, flat on top and with 5 chambers (locules) without covering membranes and closing bodies. The 5 valves open when moisture is applied (hygrochastic), the expanding (hygroscopic) keels pushing open the valves. The wings on the valves are thin. At their ends the expanding keels bear long narrow coiled, papery, pennant-like hygroscopic extensions. The capsules are soft and disintegrate soon. The seeds are reddish brown, 0,5 x 0,8-1 mm, oval to almost spherical and covered with minute rounded warts (papillate). Jensenobotrya is a monotypic genus (consisting of only one species) closely related to the genus Delosperma from which it differs mainly in its fruit capsules which have unique pennant-like extensions of the expanding keels. According to Priscilla Burgoyne of the National Herbarium, the extensions are coiled up in the centre of the capsule when dry, and when wet, they rapidly uncoil dragging out the seed. After the capsules have opened, the valves never close again due to the coiled up pennant-like extensions. Seedlings develop in suitable crevices establishing new plants. Flowering time: Plants tend to flower sparsely at any time of the year but more so during spring. Jensenobotrya lossowiana is well protected as it grows in a very isolated, undisturbed location. To the east it is surrounded by a sea of high sand dunes and to the west by the Atlantic Ocean. Large herbivores are thought to be absent but the plants are very fragile and easily damaged. Jensenobotrya is known only from the Dolphin Head, an isolated promontory along the Namib coast 110 km north of Luderitz, and its immediate vicinity. Willy Giess and E.R. Robinson, botanists well known for their work in the Namib, also found the plants at Spencer Bay and Arkona about 15 km north of Dolphin Head in 1974. Dolphin Head is a low isolated sandstone mountain (200 m high) on the coast washed by the cold Benguela Current of the Atlantic Ocean and surrounded by massive sand dunes of the Namib Desert. It is regularly covered in dense fog, the main form of precipitation in the area. The largest and best developed stands of Jensenobotrya lossowiana are found on south- and south-east facing cliffs where the species may be dominant. 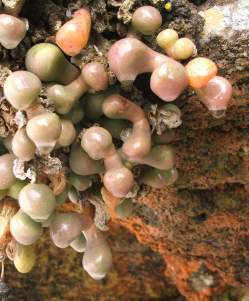 It grows at an altitude of 15-200 m. Plants occur in crevices and ledges of the lower and upper slopes in ample sandy soil, the branches often covered in lichens. The geological formation of the area is quartzitic sandstone of the Spencer Bay formation (Nossop Group, Damara Sequence). The rocks are brittle and the plants grow on inaccessible cliffs or sprawl among quartzitic sandstone fragments. 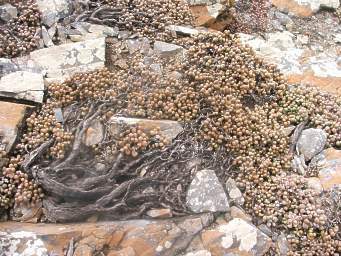 Plants can be seen hanging from the cliff faces like bunches of grapes on long stems. 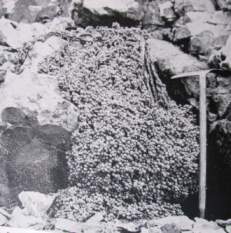 Jensenobotrya lossowiana was first found by Frau von Bodewitz of the small coastal town of Luderitz. She brought it to the attention of Emil Jensen, a succulent enthusiast in Luderitz, in April 1951. He sent the type material to Hans Herre, curator of the Stellenbosch University Botanical Garden. Herre decided that, due its uniqueness, the plant should be placed in a genus of its own. The genus name 'Jensenobotrya' literally means "Jensen's grapes", and honours the late Emil Jensen; 'botrys' is the Greek name for a bunch (of grapes), an apt description of the long branches bearing club-shaped to almost spherical leaves. The specific epithet 'lossowiana' honours Dr Otto von Lossow, medical practitioner, naturalist and mountaineer from Luderitz. He was a friend of Herre and documented the flora of the Luderitzbucht region. The leaves tend to remain turgid due to the regular fog. In the southern Namib rain occurs mainly during winter (cyclonic cold fronts) and ranges between 15 and 20 mm per annum. Dolphin Head represents more or less the northernmost region of the Namib which is subject to winter rainfall. The Namib is known as a fog desert and its vegetation is regularly subject to dense and regular fog caused by the cold Benguela Current. Temperature remains cool throughout the year except when offshore bergwinds occur and temperatures can rise to above 40°C. It appears that Jensenobotrya is fog-dependent and during a foggy spell moisture drips from the leaves (see photograph below). The plants may become very old, and Hans Herre, who named the plant in 1951, estimates that they may reach an age of at least 200 years. The author agrees with Herre: plants photographed by Willy Giess in 1974 and again in 2007 by the author have changed little (see photograph below). If so little change has taken place in 30 years, it can be extrapolated that the older plants are much older than 200 years. The leaves of Jensenobotrya often bear blackish markings caused by a fungus which is also sometimes found on the leaves of other mesembs such as Namaquanthus vanheerdei (in northern Namaqualand). The vegetation on Dolphin Head is very sparse but species associated with Jensenobotrya include Drosanthemum luederitzii, Lycium decumbens, Tylecodon schaeferi, Pelargonium cortusifolium, Pteronia spinulifera and Tetragonia decumbens. No uses have been recorded. Jensenobotrya is easily propagated by cuttings planted in sand. This can be done at any time of the year but preferably during spring or summer. The cuttings can be treated with a fungicide. Make sure that the container has sufficient drainage. Rooting is rapid and the young plants can soon be transferred to their new site. Jensenobotrya lossowiana is best grown as a container plant, or, in a dry climate, on steep half shady to sunny embankments. It should be treated as a winter- and summer-growing plant and gently watered throughout the year (due to its dependence on regular fog). It grows best in a cool situation (full light or morning sun) and is best planted in a gravelly soil. It is very fragile and should be handled as little as possible. Plants grow slowly, and when grown in a container will become pendent. Plants can be fed with a mild organic fertilizer. I am grateful to Professor Braam van Wyk of the University of Pretoria for sponsoring an expedition to Dolphin Head. Volker Jahnke of Luderitz took the author to Dolphin Head and Arkona. Gerrit Germishuizen and Emsie du Plessis edited the text. Burgoyne, P.M. 1998. Jensenobotrya lossowiana : an island of genetic material in a sea of sand. Aloe 35, 3 & 4: 94-96. Giess, W. 1974. Zwei Fahrten zur Jensenobotrya lossowiana Herre. Dinteria 10, June 1974; 3-12. Hartmann, H. 2001. Illustrated handbook of Succulent Plants. Aizoaceae F-Z. Springer, Berlin. Herre, H. 1951. Jensenobotrya Herre gen. et spec. nov. Sukkulentenkunde 4: 79-80. Herre, H. 1971. Genera of the Mesembryanthemaceae. Tafelberg, Cape Town & Johannesburg. Smith, G.F. et al. Mesembs of the world. Briza Publishers, Pretoria. Schwantes, G. 1957. Flowering stones and mid-day flowers. Ernest Benn Limited, London. Robinson, E.R. & Giess, W. 1974. Report on the plants noted in the course of a trip from Luderitz Bay to Spencer Bay, January 10-21, 1974. Dinteria 10: 13-17. 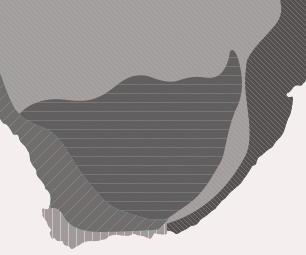 South African Committee for Stratigraphy. 1980. Handbook 8, Lithostratigraphy of the Republic of South Africa, South West Africa/Namibia and the Republic of Bophuthatswana, Transkei and Venda. Government Printer, Pretoria. Van Jaarsveld, E.J. & Pienaar, U de Villiers. 2000. Vygies, gems of the veld. Cactus & Co.